From left, Evan Barrett (Isaac), Charles Leggett (Arnold) and Gretchen Krich (Paige) star in “Hir,” now playing at ArtsWest. It would be difficult to feel any other way. When you walk into the theatre to find your seats, things are already in motion. The actors are moving around on set, which stretches across the interior of a home. Arnold, played by Charles Leggett, is dressed in a woman’s nightgown and a clown wig, wearing brightly colored make-up and leftover porridge that’s drying on his mouth. The house is in disaster state. Laundry is strewn everywhere. The kitchen is in disarray. An anarchy symbol is painted on the wall. And then there’s Paige, played by Gretchen Krich, a woman at the cusp of freedom, newly liberated from her oppressive marriage to Arnold. She is ready to head on her next journey, as employee at a non-profit and teacher to now-home-schooled transgender teen Max, played by Adrian Kljucec. The drama starts when Isaac, played by Evan Barrett, returns from combat to help take care of his ailing father and reunite with his family. His nervous reaction to how everything has changed is acutely physical. He vomits several times in the sink, but he contends that his weak stomach is a holdover from his post in the Mortuary Affairs department, from which he was recently dishonorably discharged. As Isaac tries to understand his place in his upside-down family, the audience also seemed unsure of how to respond to the situation, sometimes reluctant to laugh at the funny lines, because of the heavy truths simultaneously exposed. “Hir” is completely enthralling, after all. It’s hard to pause at a great line long enough to laugh, because you worry that you will miss something. You’re glued to the edge of your seat, waiting to see how this family and plot will progress. “The doors were kicked open,” he replied. Isaac has spent his military career picking up the pieces of bodies. Similarly, his mother Paige is picking up the pieces of her identity, post-matrimony. She is rediscovering herself, yet at the same time, unable to shake her past, her husband, her house, the structure that has shaped her and continues to hold her. Paige has hope that Max will somehow carry her to a new future, one as free from patriarchy as it is liberated from gender norms. She almost resents Issac for coming back, as though he symbolizes the establishment, order, rules. “Don’t you try to rein me in,” she tells him. The story of how Paige will handle having the script flipped, of how she is now in charge of a husband who was once abusive, is fascinating enough. But each character has an equally interesting story. Max tells of gender identity and changing society. Isaac carries a longing for home, a place where he has long wanted to return, a place that symbolizes normalcy and a refuge from the military. Still, home is elusive and has changed while he was away. That’s a sentiment that at least a few audience members will understand. When the curtain closes, you’re left with vulnerability, anger and sorrow. There’s no neat wrapping up of this complex scenario. Do you feel hope for the future? That’s another question entirely. 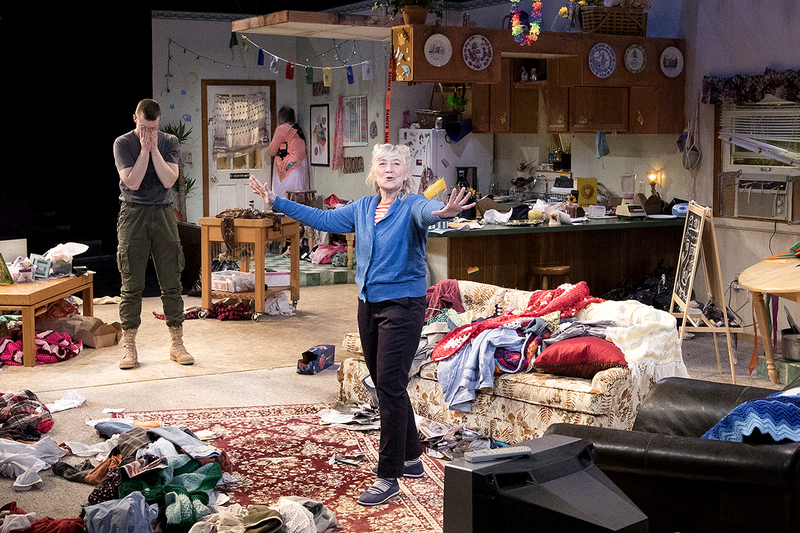 ArtsWest Playhouse and Gallery joined forces with Intiman Theatre for this Seattle premier that explores gender, identity and family, all hot-button contemporary issues. “Hir” runs through Sunday, March 25 at ArtsWest, 4711 California Ave SW. Show times are 7:30 p.m. Thursday through Saturday and 3 p.m. on Sundays. The play is directed by Intiman’s artistic director Jennifer Zeyl. The creative team includes Julia Welch and Timothy White Eagle on scenic design, costumer designer Pete Rush, lighting designer Robert Aguilar, sound designer Matt Starritt, assistant scenic designer Silas James and properties manager Andrea Spraycar. Hatlo serves as assistant director and Nina Williams as stage manager. Mac, a New York City-based actor, playwright, performance artist, director, producer, and singer-songwriter, was a finalist for the 2017 Pulitzer Prize for drama and a recipient of the 2017 MacArthur Genius Grant. The strength of Mac’s writing in “Hir” makes it a knock-out show. Each character brings a unique voice to the stage. Together, they open, or kick-in, doors, creating the type of experience that will leave you thinking about the play for days.